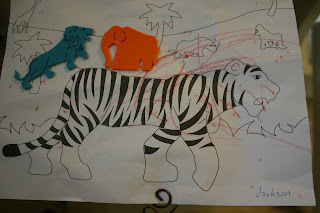 My child's first masterpiece. If you squint you might see the red crayon marks. Bill's love language has never been physical touch. But now that he has to compete with Jackson for my attention, sometimes he forgets himself. Little Monkey before school yesterday. 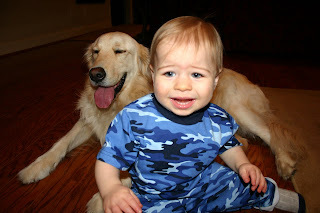 I did not have time to buy him a new picture outfit, but this one is really cute. We got it last week at Janie & Jack. They have cuter girl stuff, in my opinion, but it's a great store. Please don't hate me because Mama needs to win a Dyson. I have always and forever wanted one. Not that we could afford one, but I DO NOT want one from my hubby (or my mother, who has traditionally been the main source of my wardrobe, for which I am very grateful) for Christmas, Valentine's Day, our anniversary, or my birthday. Mother's Day would be fine. Anyhow, Mama's gonna win her a Dyson from the contest at 5 Minutes for Mom. If you feel good about decreasing my chances of winning, you can enter too. -The first time I'd ever seen a funeral procession for a police officer killed on duty. It was very moving. There were hundreds of squad cars driving down the freeway with their lights flashing. -A blessing because I got to meet Stephen and Star's new baby girl, Hope. -My first experience at a town hall meeting. -The first time Jackson was sent home from school for being sick. -Jackson's first time to bring home artwork. He "colored" on a piece of paper and it was sent home in his bag. It's on our fridge of course. -The day NBC was showing 5 of the best Office episodes. -When some bad storms came through the area and knocked out our electricity during the Office marathon. We did get to see the last two. -When we go to Gymboree. -Date night for me and Hubs. -Opening night for Blades of Glory. -The most random post of all time. Exciting times in the Big D! 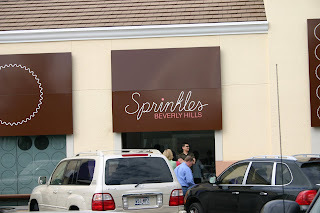 Sprinkles, the cupcake bakery from Beverly Hills, has graced us with its presence. And FAMOUS PEOPLE eat there, y'all! It only opened three days ago and yours truly and Baby Boy have already paid them a visit. I mostly blame Sunni, who keeps me aware of anything noteworthy going on within driving distance. But it's not that unusual that I knew about it since it made the evening news and all. 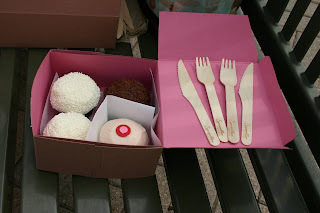 So we packed up the babies and headed down to Sprinkles. I brought my stroller in case there was a long line out the door. My camera had to come along because I would need to document said line. And the line did not disappoint. These are some GOOD cupcakes. I got a box of four - 2 vanilla, 1 milk chocolate, and 1 strawberry. I was amazed by the vanilla. The other two flavors were fine. But the vanilla. Oh the vanilla! Not your run of the mill, civilian vanilla - Madagascar bourbon vanilla cake with creamy vanilla frosting. The cake part was delicious and the icing was magnificent. My favorite part was the thick layer of white sprinkles that gave it a little crust. There was crisp in the crust. If you are an out of control fan of icing, you can get an icing shot for 75 cents. 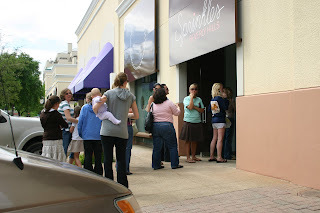 I have documented our Sprinkles experience for those of you who are considering going and also for those of you who may never make it to Dallas for this special opportunity. I love how they just really felt led to put "Beverly Hills" on the signage. Sunni and Ava going through the line. You can see the cupcakes displayed behind them. Brown box, pink on the inside, sitting on a cool counter. It's almost too much. A better view of the cupcakes. 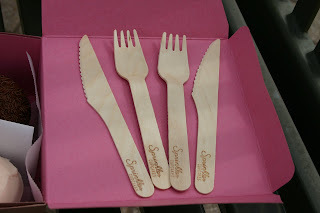 I loved the wooden knives and forks! They're kind of like the wooden spoons you get with tiny cups of ice cream, but much fancier. Now we know why the cupcakes are so expensive. Take it all in, baby boy. 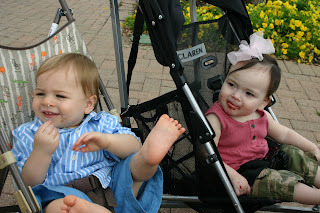 The babies were entertained by the school children playing nearby in their little plaid uniforms. Notice how Little Missy is sitting like a lady and The Mister is sitting like a man. 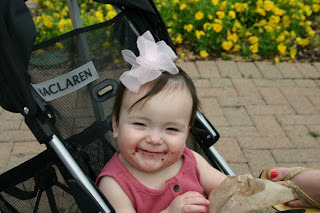 Ava enjoyed the red velvet cupcake. Jackson got frosting on his leather shoes. They came off pretty quick after that. The line out the door as we were leaving. Y'all, please be a blessing to yourself and go read about Sunni's latest pedicure experience. 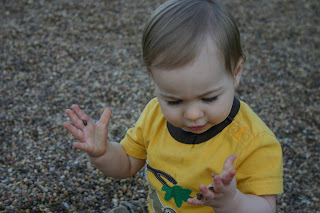 Sunni's blog is "Ava" under "Jackson's playgroup." Today was picture day at MDO. His first school pictures! Exciting, right? 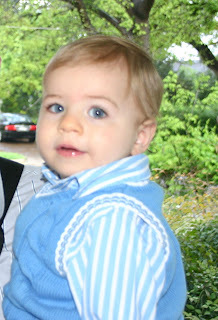 I dressed Jackson in some blue linen shorts and a matching shirt and sweater vest. He was so preppy and so handsome. Impossibly cute in this mother's eyes. His daddy took him to school and I picked him up at the appropriate time. He still looked precious when I got there. In fact, he was sitting in a little chair eating a snack. His teacher told me he likes cheese. No kidding? Do you know his parents? 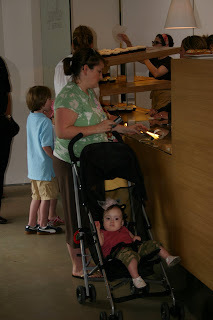 I was so happy because I was just dying to see my son sit in a chair at a table and eat like a big boy. And then I overheard the director telling another mom that picture day is Thursday. All I could do is roll my eyes...at my own self. So this is how it's going to be, huh? I'm going to be that mom who either forgets picture day or sends her kid, her SON, all dressed up a day early. Two things: I have to find another equally cute outfit for Thursday. There's no way he's wearing this one again because it will be so obvious (as if it wasn't already) that I got the day wrong. And, this is good news to all my friends and family, I'll also be getting a planner. Look out for the new organized me in April. Thankfully I took a quick picture as my boys were leaving. He is not as big as he looks in this outfit. The night of Maggie's wedding I returned home to my parents' house and beheld a wonderful smell. As I got out of the car the aroma of crawfish boil spices filled the air and cleared my sinuses. The neighbors across the street were having a party in their driveway. It was all I could do not to walk over there and crash the party. Except I was wearing a new black dress and my dressy coat from Arden B. And Mom had gotten my hair just so. It was not the right time. 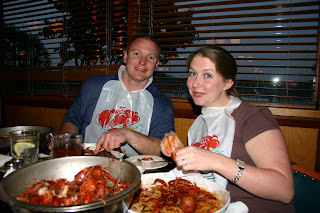 I was dressed more for lobster at Pappa's steak house. 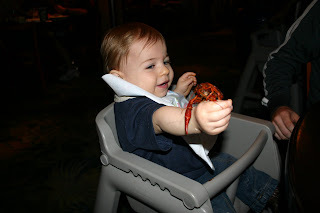 But tonight, yes tonight, was the night for crawfish at Pappadeaux. I dressed in a black t-shirt and pulled my hair back just so. I was ready - more ready than I'd ever been with a pack of diaper wipes waiting to be of service. Our friends Justin and Jennifer met us there. They are possibly the biggest crawfish lovers this side of Louisiana. I called them as soon as I left Houston and pleaded for them to feed me some mudbugs...and soon. 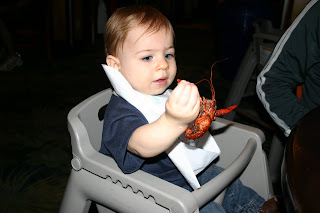 My husband is allergic to shellfish, so I can't go to him for my crawfish needs. 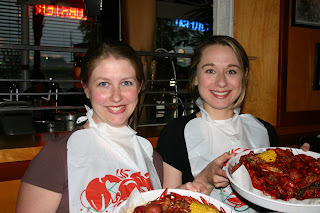 We had a great time fellowshipping over the crawdaddies. I think it is less of a meal and more of an event, which is probably why I like it. They really are kind of nasty, or rude as my dad says, little creatures. But the seasoning makes it so good. When we were teenagers Jennifer, Justin, and I would go down to the Crawfish Festival in Old Town Spring. Those were fun times. I was even crowned the Crawfish Queen my junior year. Totally kidding. But that would have been awesome. 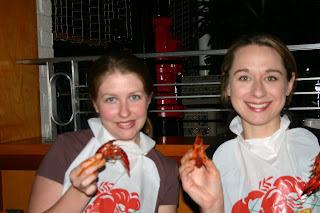 Jen and I did proudly wear our $7 plastic red necklaces with little crawfish dangling on them. I so wish I could provide a picture of that. 1) The pegleg crawl - This occurs when Jackson crawls with one knee on the ground and the other sticking out to the side. It's very hard to picture, but he's crawling on one knee and one foot. He looks like a little pegleg pirate or a crab. 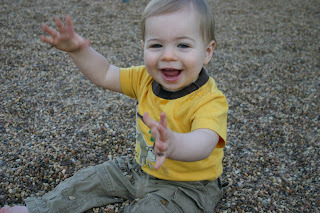 2) When he gets his second wind before bedtime and he crawls around in circles and hyperventilates. 3) How he loves his new maracas from Honduras and sometimes gets right on the beat to whatever music is playing. 4) How he leans in for a kiss and tries to imitate the mwhah! sound of a smooch. 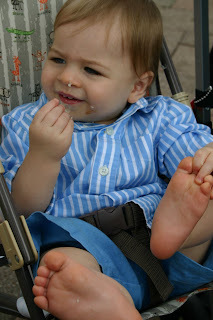 5) When he blows kisses, which he only likes to do for mommy when no one is looking, he says, "Buh." 6) When I suddenly look over at him and he was already looking at me with a big smile on his face. Wow, I do not deserve to be loved like that! 7) How he laughs softly and smiles when I lay him down at night. 8) How last night at Daniel and Amy's going away party, he clearly preferred being held by daddy instead of mommy. 9) How he sleeps from 8 to 8. Glory to God. 10) The little gaps in between his teeth. Wait, I'm not done! The curls in the back of his hair. His laughter. The one little fleck of green in his otherwise blue eyes. How he tries to crawl away from me when he knows I'm about to take him out of the bathtub. About three weeks ago my husband spent an entire Saturday in our backyard. I didn't realize it, but he had big plans. Hours into the project I let Beckham out the back door and saw that Curtis had built a fence across a corner of our yard. He forgot to run that one by me. It was definitely a wood fence built with leftovers we had from remodeling the house. And it closely resembled a horse corral. "Am I getting a pony?" I asked. It was to keep Beckham, who is quite pony-like, out of a certain area so the grass would grow. I was horrified by the fence and I thought my husband had lost his mind. We don't have a privacy fence in our backyard and this lovely makeshift corral would be visible to the neighbors. And to me...every time I stood at my kitchen sink, walked through the laundry room, or let one of the animals outside. It was hideous. Lord, WHY can't we have deed restrictions? Is it bad that I wanted to tattle on my own husband? Within two days Beckham conquered the barrier. This further fueled my distaste for the Stupid Fence. "It doesn't even work! When are you going to take it down?" You could have smelled my attitude four blocks away. Then Spring Break came and brought some nice rain with it. Beckham was in Houston with me - four hours away from the sacred corner. When we returned, the whole area was filled with very tall, very thick grass in a shade an Irishman would be proud of. Mission accomplished. On Thursday evening Jackson and I were out and about and Curtis was here doing another project. When I got home, the ugly pony fence was gone, the grass was mowed, a new flowerbed was prepared, and there was a little path of river rocks. The crowning glory of it all was a wooden swing for two, complete with citronella torches nearby. Backyard hades has been redeemed. A little piece of heaven is visible to me every time I stand at the sink, walk through the laundry room, or let one of the animals outside. That was the plan all along. I can't believe it, but I'm glad he "forgot" to run that one by me. Call me Humbled. 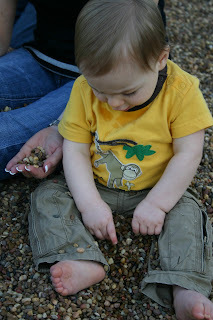 Every day of motherhood has one of those I know that did not just happen moments. Yesterday's was very special. I had taken Jackson's pants off since they were super long and I wanted him to be able to move freely in case he wanted to try walking again. He was playing in the living room with all his toys, including his piggy bank and coins. Later we went into his room for some reason and were wrestling around on the floor. After a fun hair-pulling experience I sat up and saw that one of the big plastic coins from Jackson's piggy bank was sticking out of the back of his diaper. What in the world? He must have dropped it straight behind his head. And then I plucked it from the diaper. And, SURPRISE, it was covered in poop. WHAT IN THE WORLD!?!? You know what? My mind really could not comprehend what had just happened and I stared at it trying to think what else it could possibly be. It was definitely poop. I guess that was practice for when he swallows a nickel one day. Tonight we went with all the youth and some college students to play laser tag. I thought you might like to know that your mama came in second place on her team. Victims were yelling out her name - Duce, which was supposed to be Goose - because she was so ruthless. She was a sniping fiend. And your dad, well, he was the second and then third highest scorer of everyone who played Laser Tag the whole day. Typical. I promise neither of your parents is competitive at all. These are some pictures that went wrong for one reason or another. If you have disappointing, weird, or just plain bad pics that you want to share, today could be the day. 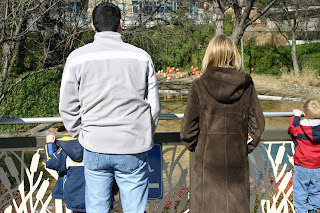 This one of Matt, Lindsay, and Gavin at the zoo would have been perfect if the child in the red jacket had actually been Gavin. Then again, half of him is missing. 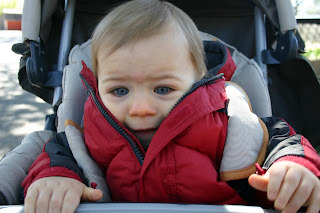 My child looks like a turtle poking his head out of his jacket. The focus was off in every single one of my airport pictures. I was trying to get Jackson to look forward and face the camera, but it definitely appears that I am making a gang sign. And Jackson is so hungry he's eating his arm. When my sister and I were little girls we had amazing 80's and 90's bangs. We took turns in front of the mirror with mom each morning where she would make our bangs be all that they could be with a curling iron, Focus 21 hairspray, and "the blue brush." It was a very special brush that we all fought over. My bangs were always ruined by lunch time because I couldn't keep my hands off my forehead. However, my sister preserved her bangs, respraying and touching them up as the day went by. Occasionally she would have the perfect bang day. When it came time to part with her bang sculpture, she wasn't always ready to say goodbye. On those days she would wash her hair under the bathtub faucet with such precision that her bangs were untouched. They remained perfectly dry and in position while the rest of her hair was shampooed, conditioned, and given a new chance at glory. Folks, that is skill right there. In case you're forming a weird idea of my sister, I need you to know that she is the spitting image of cool and has been since the day of her birth. This is a prom queen I'm speaking of. If she had let her friends in on this little beauty tip, it would have made its way to Y.M. and then to Allure Magazine and we'd all have learned bang preservation years ago. I am a happy girl. I have both my guys under one roof. Last night I put Jackson in his "I heart Dad" pajamas and laid him down for a nap at 8:00. Then at 11:20 I plucked my sweet sleeping baby out of his cozy crib. He had the most outrageous bed head he's ever had. Half of me wanted to take him to the airport just like that because it was so funny. The other half thought I might get some hateful looks for mistreating my child by obviously waking him from a deep sleep to go to the airport. So I smoothed it down with some water. Jackson didn't like that very much, so it was only smoothed about halfway. He looked a little rough. I, on the other hand, got dressed in mall-worthy clothes and put on fresh makeup. I had a new haircut and pedicure to distract Curtis from the fact that I have absolutely no trace of a tan. Jackson stayed awake in the car and he seemed very excited and curious as to why we were going on a midnight adventure. We got to baggage claim as the mission trip team was coming through the doors. Then I saw my very handsome, very tan husband in a black Real Madrid soccer jersey walk through the door. I swooned. 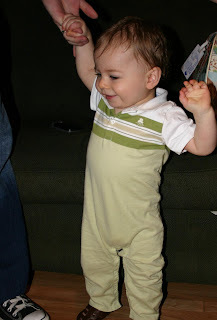 It took Jackson about one second to see his daddy and react with a huge smile and outstretched arms. He wanted Dada to hold him. There was no alternative. After a near-fiasco with the team's bags, we finally left at 12:30. When we got home Jackson was wide awake and ready to play. Forget about sleep! He has refused to take any steps or do any of his little tricks since Curtis got home. I'm not sure why that is, but Janelle and Sunni have reminded me that all along the babies have gotten started on new skills and then put them away for a while. Maybe tomorrow. Curt took the day off and we ran some errands together. We looked at new laptops for me (I'm open to suggestions) and then we went to R.E.I. to look at some sandals for Curt. He wanted some Chacos because that's what all the cool kids are wearing on mission trips these days. But when we saw that these glorified flip flops are $90 we decided to be on our merry way. I can appreciate that R.E.I. is a cool store. I thought the "personal flotation" section was especially intriguing. But I am just not an R.E.I. type of girl. I decided not to even pretend. It would be cool to have one of those tents, but then I would have to camp. And the last time I camped I woke up with dew all over me and spiders in my sleeping bag. Help me, Lord. I am more suited to Academy, where I have spent many hours loitering with my dad and sister when our mom was out of town. Melissa and I used to entertain ourselves in the fishing lure section. After squishing our hands down in the worm bar, we would look for the most flamboyantly colored one for Dad and he would act like he desperately needed and wanted that exact one if he knew what was good for him. I lied. 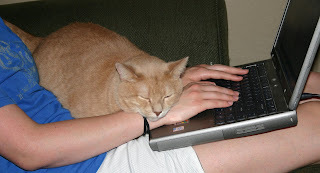 Here I am blogging again but my husband is not on the couch next to me watching basketball. He is in the air somewhere between here and Miami and I will hopefully be seeing him in two hours. In the meantime, I know he wouldn't mind me sharing this amusing little thing that happened last night at Maggie's wedding. Maggie is a friend and sorority sister from A&M. We lived together and shared a (very clean) bathroom our sophomore year. We met while helping with a food drive in our dorm complex. She was the funniest person I'd ever met and we were fast friends. One thing you should know about our friendship is that we learned the hard way that we cannot shop together. We are what you would call enablers. Somehow the combination of our personalities results in super-abounding enthusiasm and approval over pretty much anything the other likes. You would cry for my husband if I told you how much I spent on our last shopping trip. Luckily that was four years ago. It's better to leave the enthusiasm for, perhaps, the day the new outfit or shoes or purse or backpack or bracelet or shower curtain are debuted. Maggie was a stunningly beautiful bride. I watched her groom's face as she stood facing him, holding on to her daddy's arm. He had the sweetest expression that I interpreted to mean, "Oh yeah, that is my wo-man!" It was priceless. Fast forward to the reception. The cake cutting moment was announced and six girls, including yours truly, leapt to their feet and scurried over to the cake table. We made it there well before the bride and groom. And let's be clear - I was in the lead. 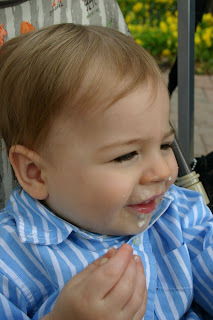 While we watched Maggie and her man cut the cake and delicately feed each other the first bite - thanking God that Drew didn't drop it down the front of her dress - a couple of my friends felt led to share their wedding night mishaps. Oh, the glory of waiting until your wedding night! One friend, who I hope does not kill me after reading this, recounted having fallen out of the bathtub in front of her brand new husband, who caught her by the arm. And this was before the excitement had begun. As we all stood laughing with our hands over our mouths from the sheer horror of it all, we were alerted to the fact that we were having this conversation about two inches from the camera man. That is going to be one interesting wedding video. Happy St. Patrick's Day! I hope you all got pinched by someone you love. I did not, but my husband will be home tomorrow night and you just never know. The fact that this day coincides with rodeo time in Houston kind of creates a perfect storm. It's when everyone gets in touch with their inner Irish cowboy. Please humor me as I share some things that connect me to my Irish heritage. -My dad's side of the family is Irish. Supposedly we were the O'Moores before coming to America. My grandparents have been to Ireland and kissed the Blarney Stone. When I was a child my grandfather introduced me to all kinds of special music like Hank Williams Jr., Jerry Jeff Walker, The Fightin' Texas Aggie Band, and Irish folk music. That was definitely not an unusual mix. My favorite song was "When Irish Eyes are Smiling." Pappaw and I developed a deep bond over all things Irish. The first time he met Jackson was exactly one year ago today, which I felt was very fitting. I had Jackson dressed in a onesie that said, "Little good luck charm." -In college I discovered a penchant for river dancing. I am quite good despite the fact that I have no idea how to dance, in a river or otherwise. 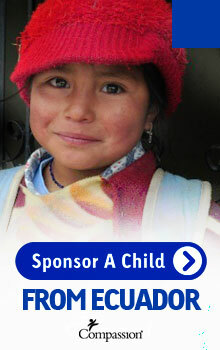 -In third grade I convinced my b.f.f. that I was a leprechaun. -I proudly wore my "Made in Ireland" t-shirt when we spent our 5 months in England. It was an absolute delight to wear it on St. Paddy's Day. Imagine my surprise when I found out that the British don't celebrate that day, despite their proximity to Ireland. And they don't think of the Irish as being very intelligent. In fact, they will call something Irish if it's dumb. Someone may have been in the wrong country! Jackson and I are finally heading home tomorrow. We've had a very sweet time with my parents and we'll be sad to leave. I don't enjoy being four hours away from them, but I know if we lived closer I would not have the opportunity to spend several nights under the same roof with them. There's something sweet about that. This house has become a retreat for me. Jackson has absolutely fallen in love with his grandparents and I know he will miss them. Next time you hear from me it will be from my very own living room in North Texas and my husband will be watching basketball next to me while I blog. Home is where the Hubs is. There have been little baby steps all over this house today! Jackson took his first unaided step last night. As with every other new thing he's learned, I of course thought was that it? Was that really his first _____? Then this morning he took two little ones toward me without holding on to anything and I knew for sure. He was so happy with himself that each time he took steps he had to stop and clap, thus interrupting any further stepping. He is also blowing kisses complete with sound effects, playing peekaboo any time he hears the word "where," and waving whenever he hears "bye." He got a little frenzied at lunch and began doing all his tricks in a row at warp speed. He ended up sacrificing one side of his peekaboo. Curt is in Honduras with a mission team from our church. Because I went to San Francisco with my mom, we have been already been apart for 9 days. I haven't heard from him since Monday and that was only a text. I kept my phone in my hand for three days straight and then finally gave up thinking he might get to call me. Hope deferred was making my heart sick. Today my phone died and I just didn't feel like looking for the charger. I felt that it would be a relief to just accept that I would not be hearing from him and surrender even the slightest possibility of getting to talk to him. Somehow that gave me some control and it helped my frame of mind. 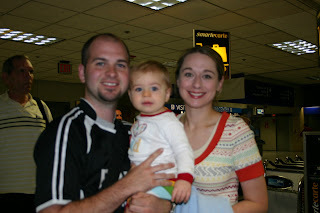 Knowing Jackson would be walking any day, I had this incredible vision of our reunion with Curt at the airport. I would set Jackson on the ground and he would walk right up to his daddy, who would be shocked and amazed. Now the only problem is that his flight doesn't land until 11:30 Sunday night. My dilemma is whether I should wake Jackson up and take him with me or get someone to stay with him while I pick up his daddy. Either way, Curt is not going to be able to leave Jackson in his crib when he gets home. He will be too excited to see his boy. We'll see what happens. My little vision will never play out the way it does in my mind, but it would still be sweet to have Jackson there. All I know is my hubby is going to be very tan from the Honduran sun and looking svelte from only eating ham sandwiches. Meanwhile I am glowing white. My only consolation is that this week I saw a number on the scale that came within a half pound of what I weighed in college. P.T.L., y'all. Dada, it's time to come home. 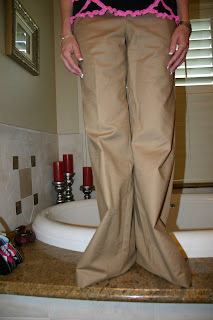 The picture in which my mother's pants looked like the Little Mermaid. 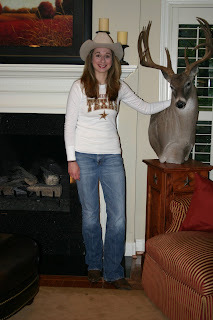 Last night was girls night out to the Houston Livestock Show and Rodeo. We really had a burden to celebrate our Western heritage together. We had free 5th row tickets to see Rascal Flatts, courtesy of some wonderful friends from HFBC. It was even down in the section with free food. I had just headed out in an awful storm to pick up my friends Kay, Christine, and Michelle when I was told that Rascal Flatts (later inadvertently renamed Flascal Ratts) cancelled due to a bout with bronchitis. Apparently someone in our group, whose initials are Christine Mangrum, bragged extensively about our tickets and the Lord needed to humble her a bit. Thanks a lot, Eve! I'll be honest, I was not disappointed in the least because the replacement was Clay Walker. Clay Walker! I would know every song! I had seen him four times before, twice at the rodeo, and he gives a great concert. While I had planned to learn all of Rascal Flatts' songs, I got lazy and just didn't. So I know a few hooks and that's it. One night "Bless the Broken Road" came on the car radio and I sang my little heart out for Curtis. I kept coming in a little early on one part and my hubby told me I needed to WAIT FOR IT and if I didn't learn it good I would be HUMILIATED at the rodeo. Thank God that did not happen! Back to the rodeo. You better believe we all had our boots on and Kay and I both wore our hats. Mine was a little small. I have a knot in my forehead from the pressure, but I absolutely could not take it off because of the severe case of hat hair I might have had. Michelle sat next to me and she also has knots in her forehead from every time I bonked her in the head with the brim. We waited about two hours for Clay Walker to take the stage (11 p.m.) and his set was way too short considering what we had been forced to listen to beforehand. Even if those other two performers are normally good, it was an off night. I heard they got no rehearsal time and if that's true, then bless their hearts. I wish we had known that last night. It turns out Clay Walker has put out several new songs since I last saw him in '99. So no, I didn't know all the songs. And what is the biggest tragedy of all is that he did not sing my favorite love song of all time - This Woman and This Man. Clay, if you're reading this, I do still love you in the Lord Jesus. Yes, I'd say it was a bit of an off night. Thankfully, my friends are some of the funniest people on earth and we entertained ourselves and annoyed everyone around us for several hours. Christine was in rare form and she had us rolling. We really did have a blast together. We actually toyed with the idea of seeing Beyonce' at the rodeo instead of Rascal Flatts. But there's something weird about not seeing a country artist there. I think we all regretted our decision in the end. The night was redeemed when the Irreplaceable video came on the jumbotron right before Clay came out. It was hands down my favorite moment. -The following sentence was overheard near the AGventure area: "You do meet a lot of people at pig shows." -Hearing incredibly romantic songs like Tequila Makes Her Clothes Fall Off, Barbie Doll, I Saw Mama 'Fore She Was Mama, and When She's Good She's Good but When She's Bad She's Better. We were privileged to hear some of country music's less delicate offerings last night. I guess that's what you get when you see 3 different male performers. And there was a lot of dancing from the pelvis. Attention all males...only drunk women think that is in any way attractive. That move should have died with Elvis. -Getting a BBQ chicken sandwich and potato salad from the Goode Company stand. They only serve the chicken sandwich at the rodeo, folks! Get it while you can! When all else fails, eat popcorn. We are cracking up because the lady in front of us managed to take this picture at waist level using the timer. Courtney, would you care to explain this picture on your Schiskablog? This sort of has the feel of a senior picture. I'm posing with my dad's prize buck. You are seeing that right - it is indeed mounted on a stand in the living room. And a candle is growing out of my hat. Tomorrow is the blog's birthday! My first post was March 13, 2006. I wish I had started the blog during pregnancy like Janelle, but it was not to be. And it got started almost a month after Jackson was born because who can blog when they are incoherent, engorged, and constantly emoting? Yes, it was better that I didn't blog until March 13. This was actually my second blog. I wrote my first one anonymously so that I could say anything I wanted. But I had no one to read my anonymous blog. And everyone knows that comments and readers are very helpful in keeping you going. The only comments I had were spam. I guess it wasn't juicy enough. I just looked at that old blog for the first time in a year and a half. I forgot how much I had written and I enjoyed reading what I wrote before my brain turned to mush. 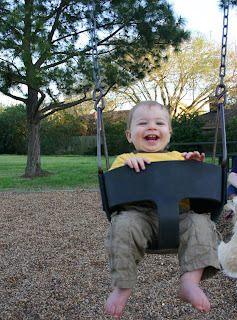 Ironically, the blog stops right before I found out I was pregnant with Jackson. That's too bad. Boy could I have told some stories! There would have been much more about pregnancy, breastfeeding and post-partum recovery than even an OB cared to know. Thank you to my sweet friends who have kept up with the blog this last year. You have encouraged me to keep writing down these memories. I will be even more thankful for you on the day my baby gets on the school bus for the first time and I come inside to read all these posts and have a good ole catharsis. And thank you to my 6th grade language arts teacher at Truitt Jr. High, Mr. Peter Loudis. If anyone knows him, please give him the url. He made us write in our journals in class every Monday to tell what we did that weekend. He was the ultimate commenter and he made me love writing. 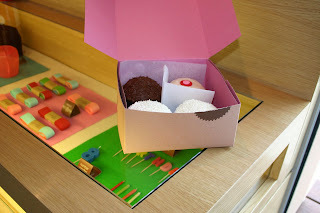 So let's have a little birthday party for the blog. 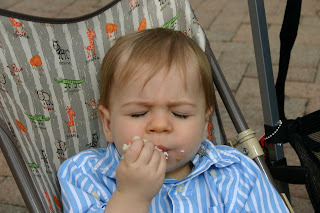 The blog's birthday wish is to hear from anyone who has never commented before. So grab the closest piece of cake (it can be a Little Debbie), some punch (Kool Aid? ), and your party hat (a high ponytail will do) and say hello. I'm a city girl. I love the energy, buildings, people-watching, pace, food, and shopping. Thanks to the Lord and the generosity of my parents, I have been able to visit some of the world's neatest big cities like Rome, Paris, London, New York, Athens, Jerusalem, Los Angeles, and Chicago. And Houston of course. This weekend I scribbled San Francisco right above NYC at the top of the list. I got to fly out there with my mom, our friend Amy, and Jackson. It is the most beautiful city I've ever seen. And so clean! We make fun of Californians for being so over the top about the environment, but if I lived in a place like that I'd be passionate about protecting it too. It is spectacular. The glory of God is beaming out everywhere you look. Maybe that's why you-know-who has tried so hard to make it a place of his own renown. I thought so much about Romans 1:18-32. -We had been shopping on the 4th floor at Bloomingdales, swimming in the sea of designer jeans, only minutes before the emergency alarm began going off. Keep in mind that my disaster awareness (anxiety) was very high being in San Francisco. Luckily, we were about 50 yards from the exit when it sounded. People were not moving fast enough for me. I thought, don't you know that the top floors could be ON FIRE and might CAVE IN on us ANY SECOND!?!? So in my eagerness to escape the danger I repeatedly rammed Jackson's stroller into the heels of the people in front of us. Yeah, I got some nasty looks. -Sharing fish and chips with Jackson for the first time at Fisherman's Wharf. -Getting se*ually harrassed by the elevator attendant - in a crowded, enclosed space for several minutes - in Coit Tower. Why didn't any of the men speak up for us? If my dad had been in there with us, that man would have had the tip of a Lucchese boot lodged in a place where the sun don't shine. And that was after we had to pay to use the ladies room. -The ministry of chocolate at Ghiradelli. 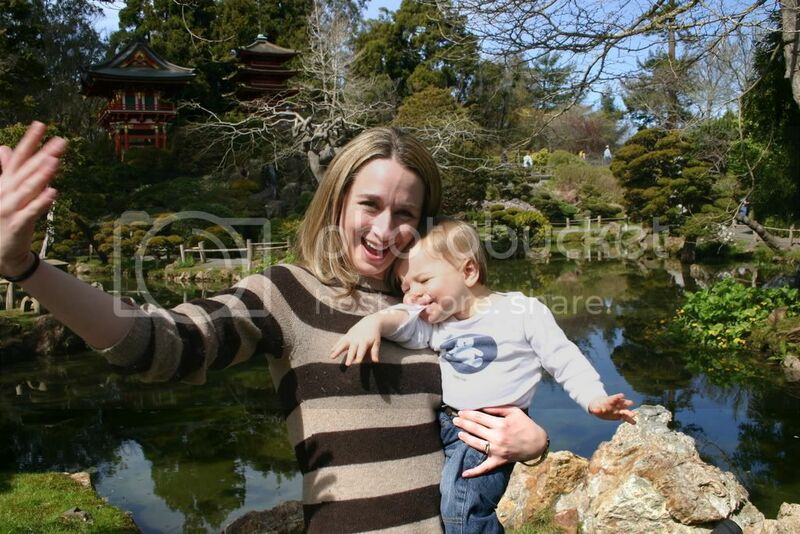 -Visiting the Japanese Tea Garden. It was totally worth the $4. -When some Asian teenage tourists took pictures with our tour guide/driver because they thought he was a movie star. -Watching people surf under the Golden Gate Bridge. -Singing to the Spice Girls with Rich while he drove us around town at night. -Spending the weekend with my dear friend Amy who is like a big sister to me and Melissa. We had a blast! -Getting to worship Jesus with 8,000 women at the Moscone Center in downtown San Francisco. -Seeing a crazy lightning storm somewhere over San Angelo late last night on the plane ride home. And above it we could see thousands and thousands of starts. It was awesome in the truest sense of the word. Did you know people surf under the bridge? Alcatraz is behind me. Notice my stripes. I seem to be wearing this in 90% of my pictures. It's because I have fun tennis shoes that match it and they're good for the zoo and touring big cities.